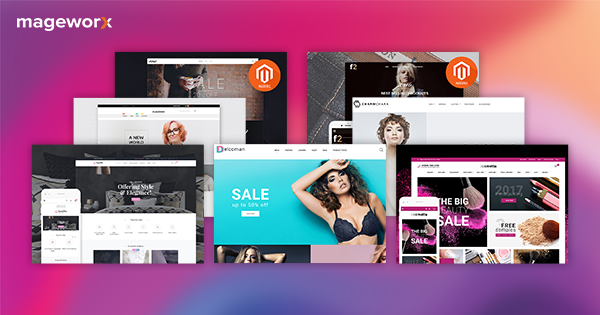 Magento itself offers a pool of opportunities to stimulate product sales and achieve business-specific marketing campaigns. 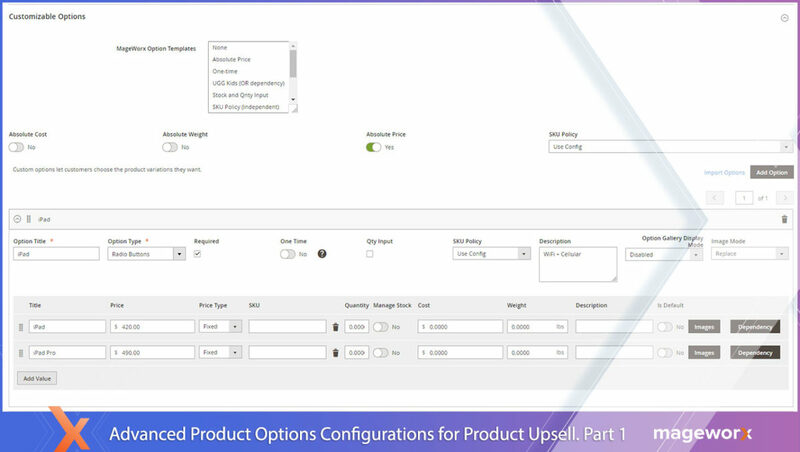 The right approach to the configuration of products with options creates a new loophole to skyrocket your sales as well as stimulate product popularity/awareness and achieve business-specific marketing goals. Let’s have an insight into the opportunities it offers. 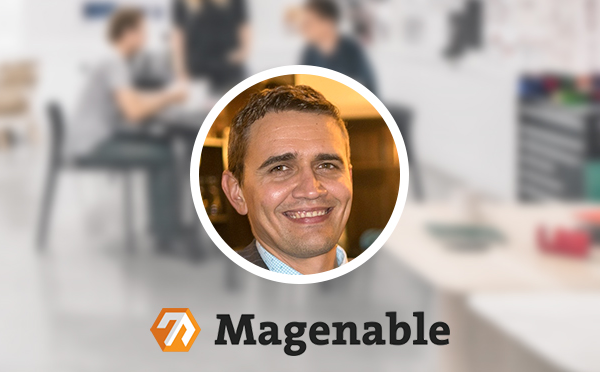 What Are Product Dependencies in Magento 2? In order to get a full understanding of dependencies – which are occasionally referred to as conditional logic, in fact – let’s take a look at some related terms. Custom Options are product variants/variations that can be made available for the customers to choose from. Color, size, material, weight, etc. are just some of the possible options. As you can see, despite the area ‘Choose an Option’ is clickable, the customer is not offered to select either the belt size or color. 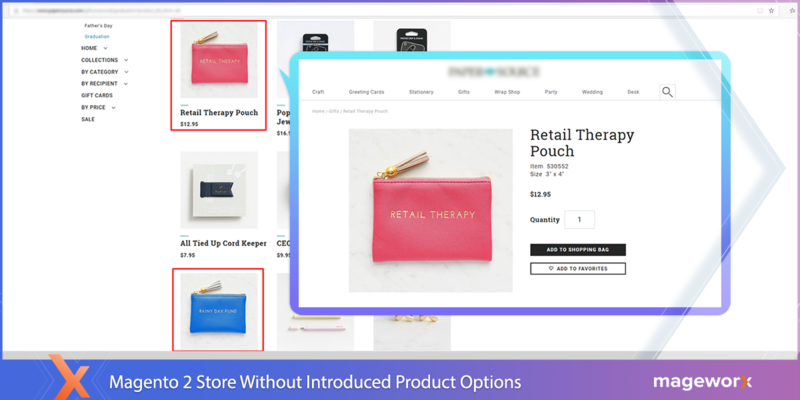 While the design of the product is beautiful, I’d personally like to see more color options when shopping online (without having to leave the page and spend time doing the research). In the “Graduation Gifts” category, I found a series of alike looking pouches. They were listed as separate products but had a similar shape. What distinguished the pouches was their color and text. 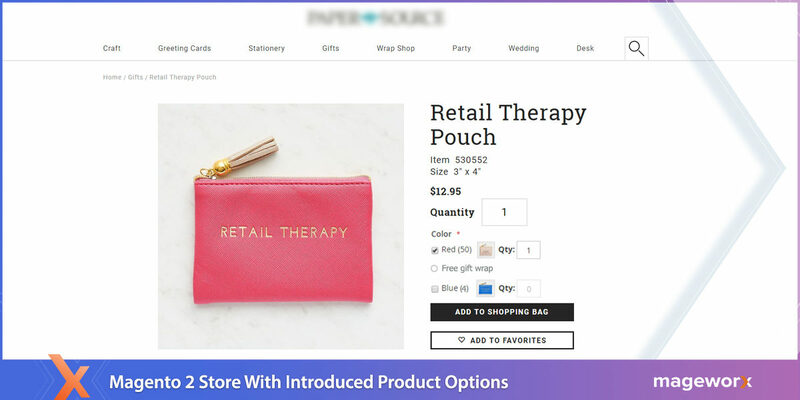 To find out more about the product options, I had to look through all 3 category pages when choosing the item, I liked the most. Putting usability aside, that’s what product options are about – color, size, text and an umpteen number of other possible product variations. They entirely depend on your business needs and can should be made available all in one place. 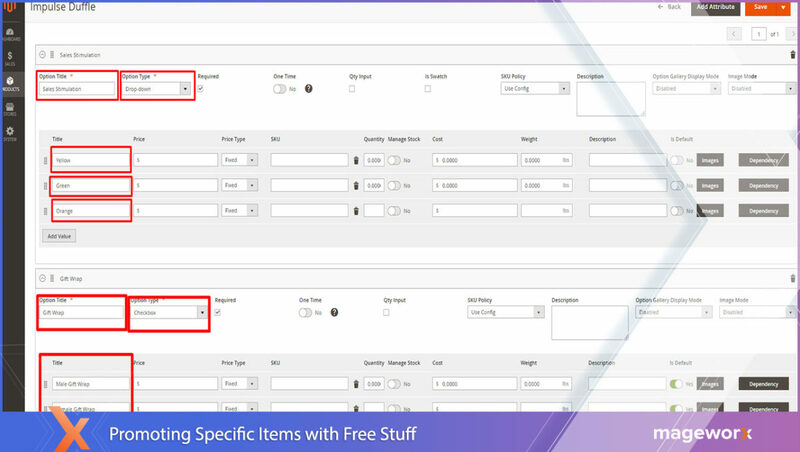 Also, within custom options, you can set up option-specific values, which are basically sub-variants for the created custom product option. These terms are easy, but still a few lines here. Parent option is the main product variant, i.e. its the key product in the hierarchy of product options. Child options are product variants that are dependent on the parent one, i.e. they will be made available if the customer selects the main, parent one. Until then, they are unavailable and can be even hidden from the shoppers. Product Options Dependencies allow for creating multiple kinds of conditional logic, i.e. display child options depending on your business needs and objectives. 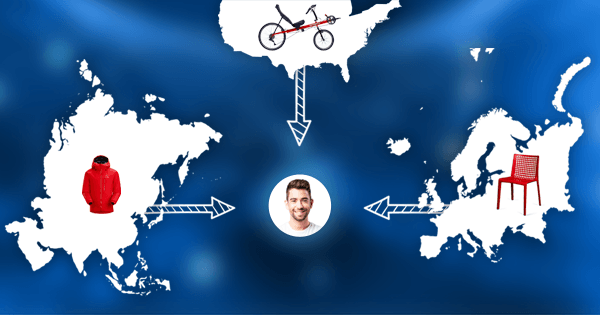 What Objectives Can Product Options Dependencies help reach? · increasing order value, and more. 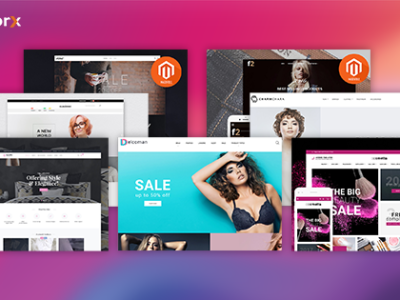 The Advanced Product Options extension for Magento 2 makes it possible to achieve these goals. Let’s have a closer look at the extension, and find what exactly should be configured to meet a specific marketing/sales objective. 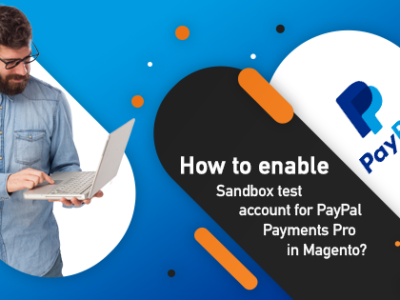 How to promote certain items with the Advanced Product Options extension for Magento 2? Some product options sell well, others sell worse. 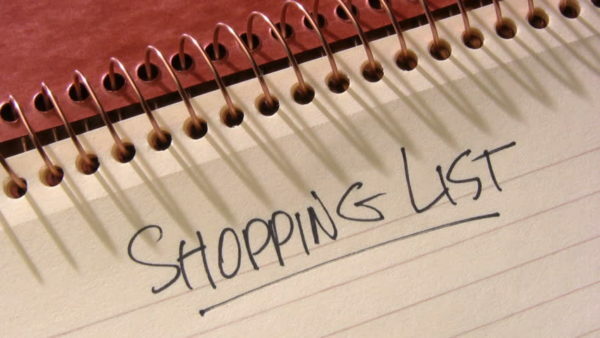 There are a great many marketing activities that help stimulate sales of specific product options. Be it offering them at a lower price, or be it giving away free stuff that follows up the choice of a specific option. The extension allows for pursuing the set marketing goals with ease. For instance, let’s learn how to promote specific options by offering free gift wrap for one of them. Let it be an unpopular color option of a parent product. 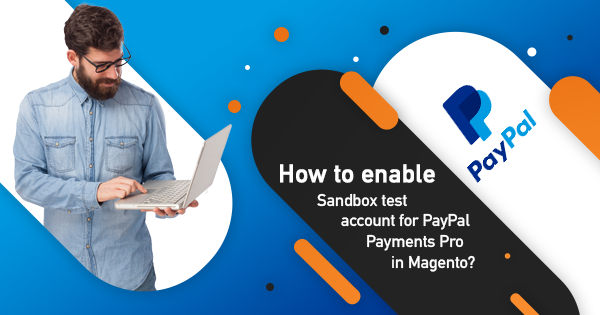 To do that, log into your Magento 2 store admin panel (if you don’t have the Advanced Product Options extension yet, click here to check out the functionality in the Admin demo). 8. don’t forget to click Save after making all the necessary modifications. You can follow these steps to make whatever promotional offerings that suit your business the best. 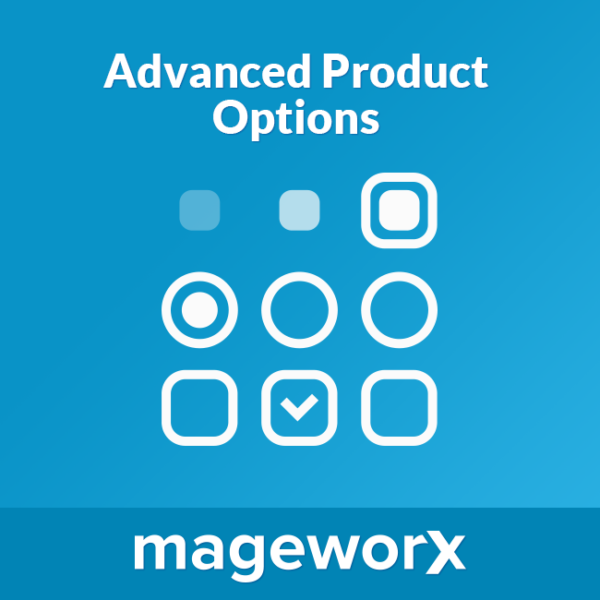 How to upsell items with the Magento 2 Advanced Product Options module? 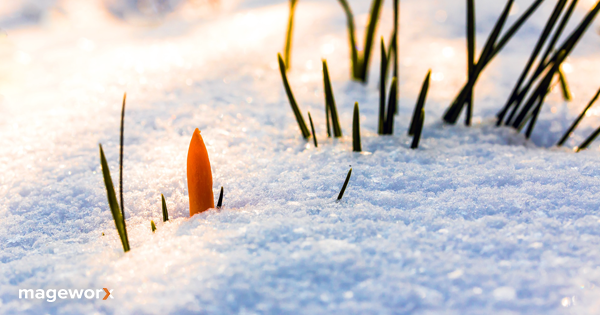 There are multiple scenarios that depend on your specific business needs. Let’s consider one out of many possible examples. Imagine, you wish to upsell a newer version of an iPad that you got to purchased on good terms, and able to offer Plus-1-year Extended Warranty for it. The configuration logic would be much alike. 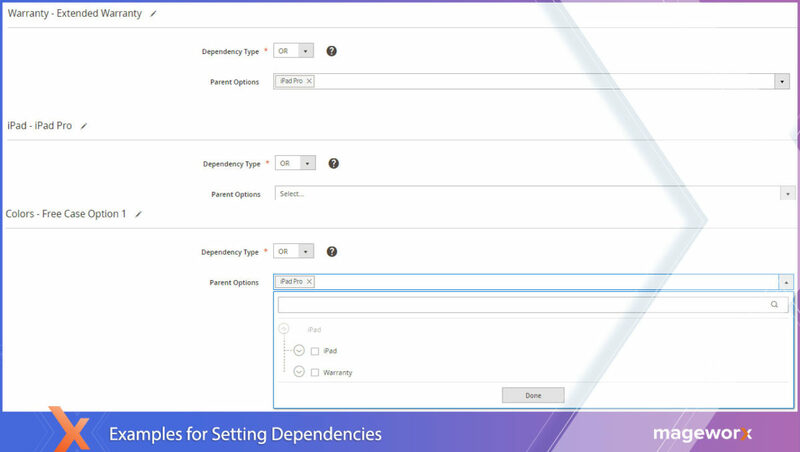 After you’ve selected the product you wish to set dependencies for, go to the Customizable Options tab. All the major configurations will be done within this tab. Note that if you wish to display option price as the main one, make sure to toggle ‘Absolute price’ to yes. You can see all the configurations I’ve made in the screenshots provided below. Remember to use checkboxes if you want to allow using multiple options, and radio buttons if only one option should be made available for selection. 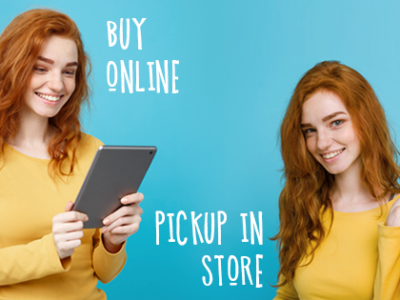 To configure images and the way you wish them to be displayed, just click the image right after you upload it and choose an option(s) that meets your requirements the best. 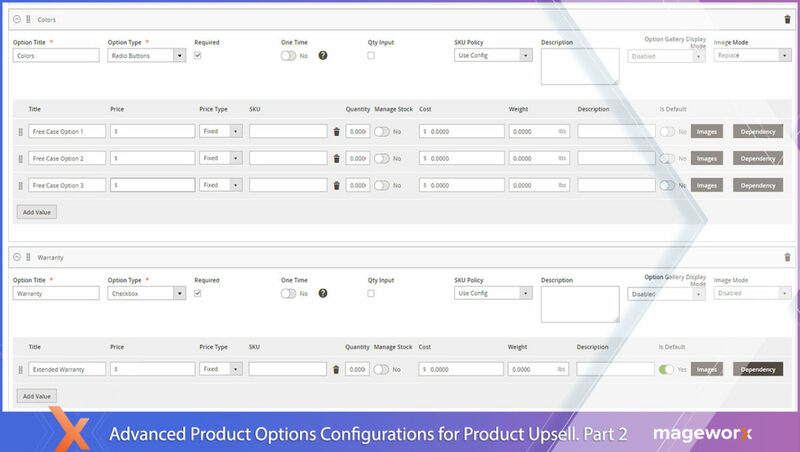 Consult the above screenshots to see what other configurations should be made to get the main image replaced by the one of the options. 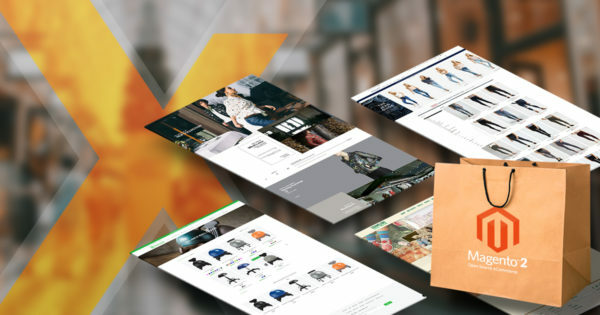 Based on the feedback from the MageWorx customers, the introduction of more options to online shoppers paves the way for a massive increase in business. 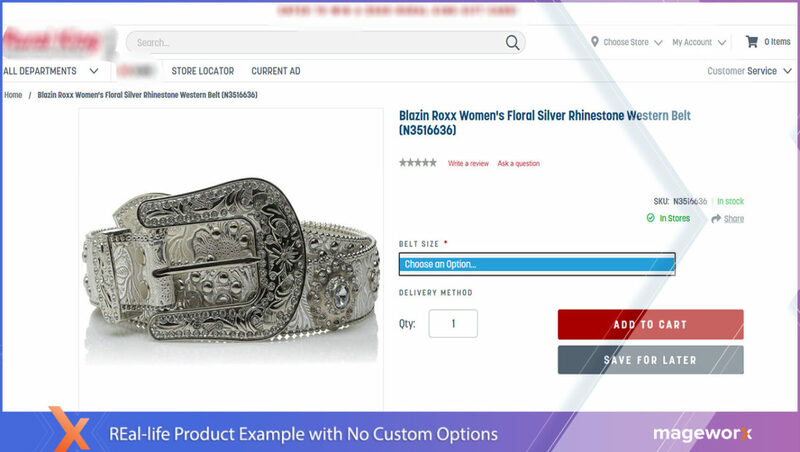 Let’s face it, customized product options – besides specific business needs – let enhance web usability, and make product selection more intuitive and less time-consuming. 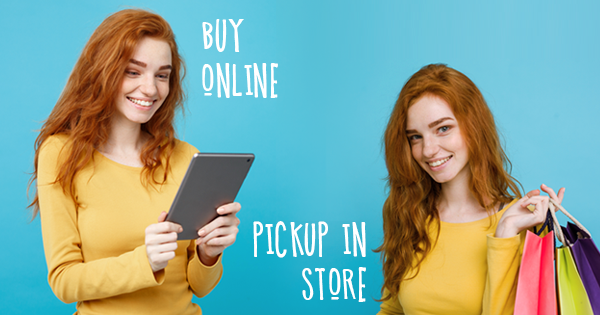 In your opinion, would the customers prefer such product selection and offerings, all in one place? Go ahead to leave a comment below, as any opinion would be much appreciated!